How do I repair a corrupt .pst file? .pst files are Microsoft Outlook's email and data storage containers. They can occasionally be damaged, but Microsoft Office includes a repair tool. When that file becomes corrupt for whatever reason, the potential for data loss is high. Fortunately, it doesn't happen often and being a single file makes it almost trivial to backup regularly. 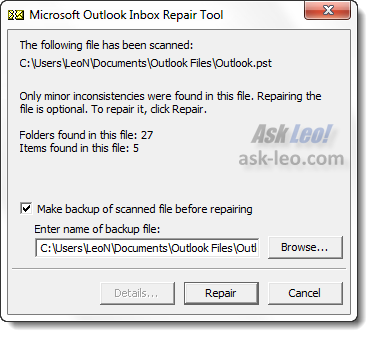 But because it can happen, Microsoft includes a tool with Office to help repair your Outlook .pst file: scanpst. 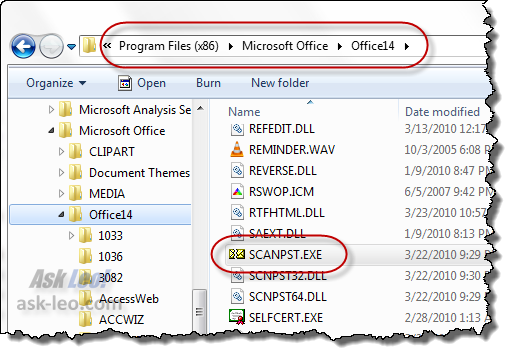 Before you run scanpst, you'll need to close Outlook if you have it running. Scanpst can't do its job if Outlook has the .pst file open at the same time. Scanpst, as its name implies, scans your .pst files for errors and repairs them if it can. Here you can see ScanPst.exe in Windows Explorer where it's located in "C:\Program Files (x86)\Microsoft Office\Office14". "Program Files (x86)" may be simply be "Program Files", depending on your version of Windows, and "Office14" may be some other number depending on your version of Microsoft Office (this example uses Office 2010 in Windows 7 64-bit). Double-click scanpst to run it. It only asks you for the location of the .pst file that you want to scan. In your case, the error message told you exactly where to look: "C:\Users\Avery\AppData\Local\Microsoft\Outlook\Outlook.pst" and that's exactly what you would enter, or you could use the Browse button to locate the file. 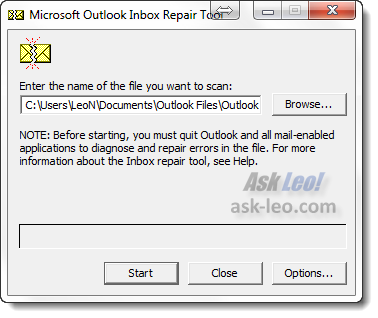 In my example, my pst file is at "C:\Users\LeoN\Documents\Outlook Files\Outlook.pst". After you've entered the .pst file location, click Start. Even though you made a backup of the .pst file before we began, it's a good idea to let scanpst make another. You can never really have too many backups. Click Repair and let scanpst do its thing. Assuming that all succeeds, you can now re-open Outlook and hopefully the errors will have been resolved. If not or if you're at all curious, you'll also find a ".log" file in the same folder as your ".pst" file that may give you some clues as to what might be happening. Chances are that there will be a lot of technical gibberish, as .pst files are very complex, but as I said, perhaps there will be a useful clue. One of the most common causes of .pst corruption, and unfortunately data loss, is having an "old format" .pst (pre-Outlook 2003) that exceeds two gigabytes in size. Even though you may have upgraded Outlook itself, the file format may not have been automatically converted to a newer format capable of handing larger file sizes. If that happens to you, you'll need to upgrade the file format yourself. In general, large .pst files are something to be avoided for a number of reasons. I do have a few hints for dealing with large pst files. Unfortunately PST repair topics tend to be magnets for comment spam relating to third party tools that supposedly repair PSTs. As a result I'll have to reject any comment that looks like that kind of comment spam. If you're legitimately sharing a good experience - I apologize, please blame all the spammers - if you have a product you wish to promote, you can read up on advertising on Ask Leo!. Where is my Outlook "PST" file located? Outlook's PST or Personal STore is a single file that holds your email, contacts and more. You can use Outlook itself to find the location of the file. What can I do about Outlook's huge PST? The PST or Personal STorage file for Microsoft Outlook can easily grow to an extreme size. There are some tips for managing its size. How do I upgrade my Outlook PST to 2003 format? Outlook's file format changed from Outlook 2000 to Outlook 2003. Unfortunately upgrading your existing Outlook PST is not automatic, and not easy. In the businees world a .pst file is perhaps the most important file for a person contrary to your statement that since it is a single file it is trivial if you loose data. That single file can contain all the email & data from many projects. Of all the files to backup that one should be #1 on the list. @Larry G, Leo did not say it was trivial if you lose the pst file, he said it was a trivial job to back it up. Completely different! Try reading the article properly before you comment (as Leo suggests). I am running Windows 7 and MS Outlook 2007. I cannot find scanpst.exe anywhere. but I could not find an appdata directory in "My computer" even when I set it to show system files. So I could not back it up. Nor could I find it when I used "search all files." However, an option reached by right-clicking personal folders, is "open outlook data file". But this too has a hidden address,(local) and produces an error message if you try to copy it or send it elsewhere. You blithely state that one should make a backup before using scanpst. But how? You may need to have Windows Explorer configured to show system and hidden files. Those are two confusingly similar yet actually very different things. Microsoft has for year "hidden" like Larry G says, maybe the most important data file of all times. I ALWAYS move that file to a location where I can easily track it, and where I easily can include it in regular backups (in my case, it is in a subfolder of "Documents"). Microsoft also has a nifty plug-in for Outlook that automatically prompts you - and does the work - of backing up your pst files when you shut down Outlook. Highly recommended add-on. Leo, in this article and at least one other, you have recommended against the most reliable e-mail program available, Outlook Express. I am writing this from a fairly speedy laptop with an i5-450 processor and 8 gigs of ram using Windows 7 Professional Edition. In order to download my e-mail quickly, I have to switch into Microsoft's Virtual XP. Virtual XP is slow, clunky, and an extra step I'd rather not take, but even so, by using Outlook Express in the virtual machine, I can still download my e-mail much quicker than I can using Thunderbird with Windows 7 in the non-virtual mode, and I'm pretty sure you could too. I have saved e-mail messages going back over ten years in Outlook Express, with never a lost message or any other glitch. Dropping Outlook Express was, in my opinion, one of the most user-unfriendly things Microsoft has done. I've tried at least seven other e-mail client programs that would run in Windows 7, and for ease of use, simplicity of interface, and just plain no-nonsense speed, none of them can touch Outlook Express. I don't have much hope that Microsoft will revive it with Windows 8, but it would sure be helpful if some smart developer would come up with a decent clone for it that would run under the newer operating systems. I ran scanpst.exe as suggested. It reported no errors. Then I booted Outlook in safe mode and continue to get a "Databinding..." message at the bottom of the screen. Then a box opens that says the file is being checked for problems. Eventually, that box closes, but the program continues to be locked up (not responding) indefinitely. This loop is repeated endlessly. I use Outlook for several email accounts including a hotmail POP file. Any suggestions would be much appreciated. IT WORKED!!!!! Thank goodness it worked!!!!! 2.3G of information almost lost. It took awhile to scan and repair but it was worth the wait. Your instructions here were easy to follow. Thank You!! I might have a similar problem after my organisation moved from Office 2007 to 2010. Now suddenly I'm repairing pst's all over the place. This keeps coming back though as soon as users put\file any new emails into the pst's, as they go bust again. Maybe i had dodged a bullet since the pst's were created in Office 2003 and the pst's sizes has grown exponentialy as user's tend to use them as "dumping sites" as soon as they get the message that their mailboxes are full. Hope you can assist. God Speed. Make sure that the PSTs are *created* using Office 2007 or later. Upgrading Office Outlook does not automatically upgrade the file format and older PSTs will break when the cross the 2 gigabyte size threshold. Thank you so very much! This worked for me first time! What a god send! 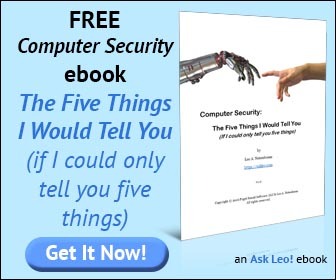 Leo: When running ScanPST.exe to repair a PST file, you should run the program 3 times in a row on the same file, or until it reports no more errors have been found. Even if it still shows errors, the program limits you to 3 runs on the file in one session. For applying pst file repair steps correctly through scanpst, it is necessary to identify the version of Outlook. These steps may differ from one version to another. You have stated good information about scanpst. Thanks for that !!. However, I have to say that we should not forget that this utility does not always solve the purpose of repairing the file. Thus keeping the backup is a safe option. Leo - many thx for this post, it got right to the point and helped me find the the inbox function in the correct folder. Thank you Leo. Even though I don't know much about computers your instructions were right on. Again thank you very much.